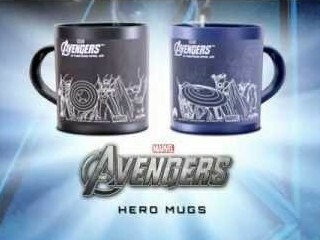 I want Jollibee Avengers Heat activated mugs!!! - Hello! Welcome to my blog! So, I was excited in getting these collectible mugs from Jollibee. (Even though I hoped for a toy) I Waited for lunch time, headed to the Jollibee branch here in Alphaland and impatiently fell in line along with the lunch crowd. First thing I asked, are the mugs available? The teller said "no". So there...Disappointed at lunch, I ordered my Spicy Chicken Spaghetti with extra rice and pineapple juice. So you ask about the mug, and here's how you get it. Just head to your nearest Jollibee store, avail of the Marvel's The Avenger Hero Mugs for only P 55 for every purchase of a Jollibee Burger or Sandwich Value Meal. Promo runs until May 15 (I think). The mug comes in black and blue, these mugs are heat activated. 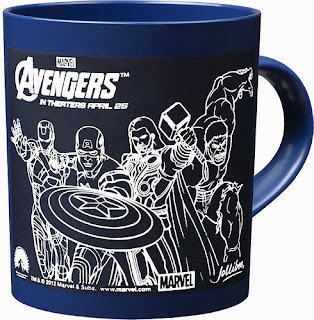 Just pour in your favorite hot beverage and you can see the awesomely designed line-art Avengers. 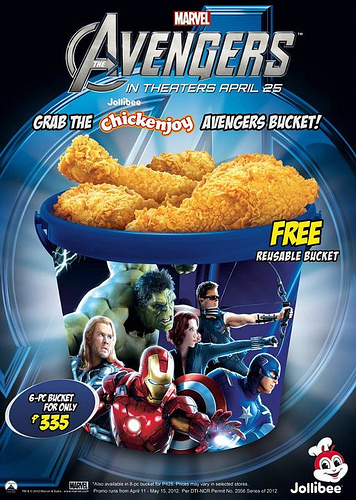 Jollibee also has this Jollibee Chickenjoy Avengers Bucket! All you have to do is avail 6 pcs of your favorite Chickenjoy and VOILA!!! It comes with a limited edition Avengers Reusable bucket for only P335! Also available: 8-pc bucket for P425. Promo runs from April 11-May 15, 2012. *10% delivery charge applies. The next time I visit Jollibee, I'll make sure I'd be able to get a hold of these 2 mugs. Haaaay yung saamen wala padaw re-order.. potek pag ako naka tiyempo dalawa agad kukunin ko.. Naka score kana ng petron? Yeah! I was thinking of the same thing! I'll let you know If I'm able to find a store that has stocks of it.